Q: The application does not run anymore and it crashes before showing the main Menu. What can I do? A: It could be an issue related to the database used to store the content. When this database corrupts, for any reason, the app is unable to start. 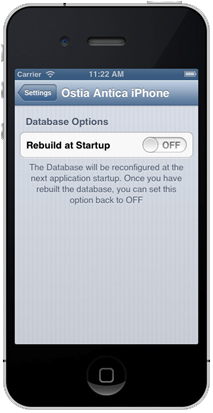 It is possible to request to the application to rebuild the database from scratch. This is feasable because the text is still available in the bundle in the format of simple rich-text files.1) Close the application and remove from background. 2) Go to the application boundle in the Settings app and select Ostia Antica for iPod or Ostia Antica for iPhone. 5) The system displays the Waiting screen. After few seconds (may be more than a few) the application will start regularly.